Welcome, we appreciate your interest in Draftech. Since 1994 we have been providing full service residential design and drafting services. New home design can be both scary and exciting, our job is to provide assurance and support backed with knowledge and experience. We provide quality home designs and plans at a reasonable price. We excel at small, large and complex luxury custom homes. Planning your next big investment doesn't have to be a daunting task; our goal is to create a design that is as beautiful as it is functional. Let us share your vision and surpass your expectations. With Draftech, you will get to experience the fun side of home design! We are a proud professional member of the American Institute of Building Design (AIBD). As members of the American Institute Building Design (AIBD), we understand that building a home will be one of the greatest financial investments of your life. That’s why we strive to approach any design problem based on the practical, functional and economical solutions that will best fulfill your requirements. We are here to guide you through the design process and make your experience as comfortable and professional as possible. Being qualified and certified designers, we can offer you advice and solutions for your home and encompass all the aspects you desire. Budgeting for your new home design does not have to be difficult. We are all unique as people, and our homes should reflect this uniqueness. We have created a pricing structure to meet the needs of both predictability and flexibility. With Draftech, you can expect the cost to be $.95 a sq ft for a finished set of plans. We schedule a no obligation meeting to discuss the expectations and desires you have for your new home. During this exchange of ideas we will establish a design program from which we will base your design. Some of the things discussed in the design conference are lifestyle requirements, architectural styles, budget constraints and site considerations. We start this process with an initial design concept and will work closely with you to render the final design. We will listen to your design requirements, master your vision, then apply it in a design schematic form. This is the phase where you see your dreams turn into reality. Through hand-rendered sketches and/or computer-generated schematics, your design will take shape. These hard-line, scaled drawings can then be used for preliminary planning and cost estimating prior to the construction document phase. The working phase is where concept designs are turned into construction documents. The working drawings are prepared in a "builder's set" format and they include the following graphical information: all elevations, main and upper level floor plans (as required), foundation-basement plan, roof plan, electrical/mechanical plan, typical sections and necessary construction details. These "working drawings" are required for constructing the home, obtaining financing, bids from contractors and acquiring a building permit per current Idaho building code. We are an architectural design and drafting firm that was established in the Treasure Valley in 1994. 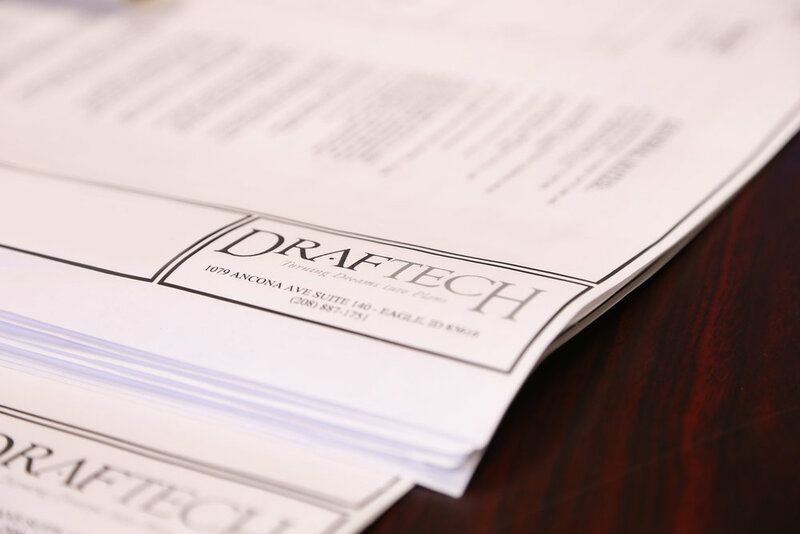 Draftech has provided drafting and design services in the Treasure Valley for over 24 years, with over 16 million square feet drawn to date. In 2007, Brendan and Michele took over the company . Original services were exclusive only to home builders; they recognized an opportunity to expand Draftech's services for both builders and homeowners alike. Since taking over, the Draftech team has successfully produced over 6,000 new home designs, from small production homes to large, luxury custom homes. Since 2009 Draftech has produced over 35 award winning Parade of Homes. We staff only the best designers and draftsmen. Our designers have both creativity and hands on experience in architecture real estate, interior design, and home building. Secondly, our draftsmen are educated in the "structural" field. They have a real working background in home building and possess a deep understanding of engineering principals, beam and floor calculations, geometry and math. This enables our plans to receive permit approval the first time. More importantly, we incorporate “value engineering” which will lower your building cost. 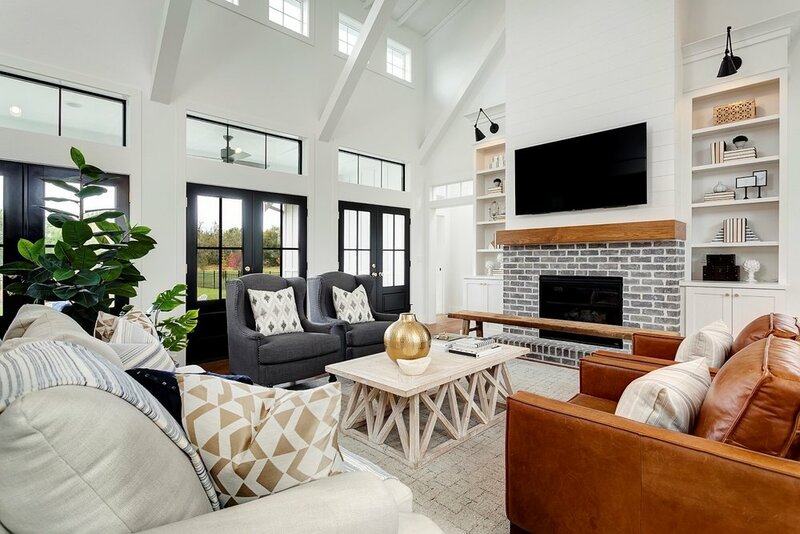 Our dedicated team prides itself on providing our clients with strong communication, fast, predictable turn-around times and well planned home designs you will love. Michele has over 11 years experience in the industry. She started her career in bookkeeping and office management for a small building contractor. After six years she decided to obtain her real estate license. For three years not only did she represent her clients with home buying and selling, but she was also involved with the purchasing and renovating of out-dated homes around the Treasure Valley. After raising her four children she attended Boise State University to pursue a degree in Business Management. She was instrumental in the purchase of Draftech, and in 2007 became office manager and head of account services. In only a few years she also showed a talent for floor plan design. Adding a woman's touch to all of her designs, she has personally designed over 6,000 homes. She keeps the Draftech engine running at its core, making her the heart and soul of the office. Brendan and Michele live in Eagle, have been married for 21 years and have 4 children. Brendan has over 24 years of experience in the building and design industry. He earned his Associate Degree in Design & Drafting in San Jose, CA in 1995. He worked in the design and drafting industry for 5 years before being offered a position as a partner in a residential construction company. Where he became a Licensed Contractor. Not only did he provide custom home designs but he also gained valuable construction knowledge and field experience. He put "hammer to nail" on dozens of his design projects from conception to reality. After moving his family to Idaho, Brendan took over Draftech in 2007 and since then has designed thousands of new homes, including over 40 award-winning designs. He heads 11 different subdivision design committees throughout the treasure valley. After gaining the required experience in Building Design, Brendan passed the rigorous exam under the National Council of Building Designer Certification (NCBDC). He is now a certified professional building designer (CPBD) and also a member of the American Institute of Building Design (AIBD). He recognizes that strong residential design comes from clear objectives, quality control, honesty and most of all a patient teaching and learning mindset. James has 14 years of CAD drafting experience. He discovered at a young age that he wanted to be an architect/drafter. In 2000 he earned his AS degree in drafting. Having passion for his talent, he takes pride in his work as if the plans are for his own home. At Draftech, he is the lead draftsman in charge of seeing that plans are completed in a timely manner, with accuracy to current codes and specs. He is also our resident arachnid killer, taking out any eight legged freak that dare enter. He has been with Draftech since early 2012. James is married and has four children. He resides in Caldwell. Rick resides in Kuna and enjoys skiing, hiking, floating the river, fishing, food, beer and family. He looks forward to being a part of a growing team and designing award winning homes. Audrey joined Draftech in May of 2017 after being recommended by her drafting instructor at the College of Western Idaho. After viewing some of Draftech's projects she says she "knew instantly she wanted to work here". She has quickly become a valuable asset to the company and see's a long future here. Audrey has lived in Boise for about 11 years, but was born and raised in Saipan, Northern Mariana Islands. It was a long swim but we're glad she made it here. She loves doing anything outdoors - hiking, camping, swimming, etc. Hannah has built her career defining the role of Project Coordinator. She has been with Draftech since the spring of 2016. She received her undergraduate degree at Carroll College and her Master’s in Mechanical Engineering from Boise State University. After school she realized that she had a knack for business organization, process flow and doing funny voices. We've been fortunate to have her bring those talents to Draftech. She loves working alongside a wonderful team whose main purpose is to design beautiful homes. When Hannah is not at work she is busy wrangling her two young children and enjoying life with her amazing husband. Ashley is the newest member of Draftech's team. She has lived in Idaho for 17 years now. Her cheerful, friendly face is the first one to greet you when coming in for meetings, and if it's not then bring her coffee or tea ASAP. Her hardworking nature drew her to Draftech and after seeing Brendan and Michele's passion for design, it quickly felt like home. Ashley is an extreme shopaholic, but also enjoys painting, longboarding, snowboarding and taking pictures. She is currently attending College of Western Idaho. She also worked for a social media company and now runs our website, pinterest, facebook and all other social media platforms. When Ashley is out of the office she's either working more, doing homework, or sleeping.